Marjorie Beth Bennett, age 89, died peacefully on Friday, October 12, 2018. She was born in Dukedom, Tennessee to Henry C. and Stella (Farmer) Austin on Thursday, August 8, 1929. Marjorie graduated from Palmersville High School, 4th in her class. 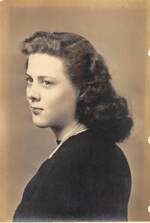 She continued her education and attended the University of Tennessee at Martin then on to the University of Tennessee in Knoxville, where she graduated with a Bachelor of Science in home economics. After college, Marjorie made the decision to put her focus on family and became a full-time wife and mother, as well as volunteering her time with the mission printing at the church. She is preceded in death by her parents, husband of 51 years Raymond Osborne Bennett, and her four siblings, brothers Leonard, Herbert, Alfred and Douglas Austin. Left to cherish her memory are son David Bennett and wife Amy; son Richard Bennett; son Stephen Bennett and wife Terri; daughter Kathy Bennett; grandchildren Chris (Megan), Kara (Thomas), Cassidy (Kyle), Casey (Jessica) and Matthew (Natalie); great grandchildren Thurston (Shea), Nolan, Nathan and Justine; great great grandchildren Ashlynn and Adalynn, along with numerous extended family and loving friends. The family will receive friends between 6:00 p.m. and 8:00 p.m., on Wednesday, October 17, 2018 at Brown’s Memorial Funeral Home, 707 North MacArthur Blvd. in Irving. A funeral will be held 11:00 a.m., Thursday, October 18, 2018 at the Beltline Road Church of Christ, 1202 North Beltline Road in Irving. A committal service at the Dallas Fort Worth National Cemetery will be held at 1:00 p.m. the same day. Please arrive 15 minutes prior to the service and line up in lane ONE. To send flowers to the family of Marjorie Beth Bennett (Austin), please visit our Heartfelt Sympathies Store.